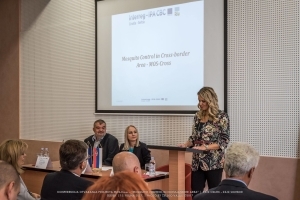 The opening conference of the Mosquito Control in Cross-border Area – MOS-Cross was held in Osijek on 15th September 2017, organised by the project partners – the Public Health for the Osijek-Baranja County, European Affairs Fund of Autonomous Province Vojvodina and Institute of Public Health Institute Sombor. 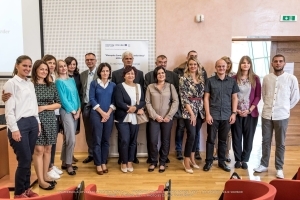 The overall objective of the project is to improve the provision of public health services in the West Bačka District and Osijek Baranja County regarding early detection of mosquito-borne diseases by improving cross-border mosquito surveillance and control. The invitees at the conference were addressed by Mr. Zlatko Pandžić, Director of the Institute of Public Health for the Osijek-Baranja County as the host of the event, Dr Srđan Merei, Director of the Public Health Institute Sombor and Mrs. Ivana Đurica, Assistant Director of the European Affairs Fund of AP Vojvodina. At the conference, Prim. 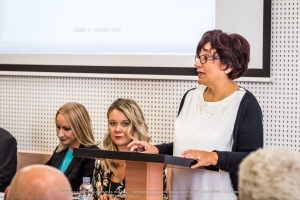 Msc Dr Dragoslava Čubrilo, project manager, presented the goals, activities and expected results of the multi-annual project, while Prof. Magdalena Sikora informed the participants about the advantages and benefits that the project would gain in the border region of Serbia and Croatia. The audience was also addressed by Mr. Stjepan Ribić, Director of the Regional Development Agency of Slavonia and Baranja, who shared his experience in the cross-border cooperation between Croatia and Serbia. The expected results of the project include the established integrated system (ICT tool) of mosquito and mosquito-borne disease (MBDs) surveillance comprising weather data, interactive maps connected to GIS pointing to mosquito breeding sites, data on number and flow of mosquito population including an early warning system for MBD presence in the area. District and Osijek Baranja County by environmentally responsible mosquito abatement treatments. As a significant activity of the project stands out the improvement of knowledge of relevant actors and the public (pupils, elderly citizens, citizens, etc.) on individual mosquito population control measures accompanied by the distribution of free biological preparation for mosquito abatement. 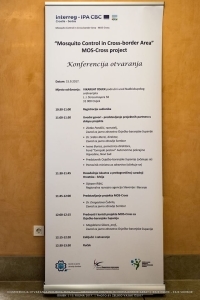 The MOS-Cross project, with a total value of EUR 982,167.50, was approved under the Interreg IPA Cross-border Cooperation Programme Croatia-Serbia 2014-2020 and the project was given the highest marks within the measure from which public health projects were funded.